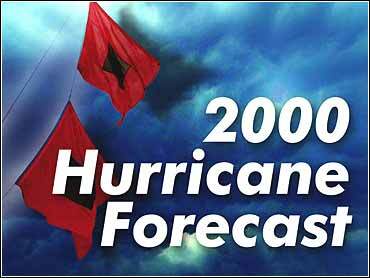 Hurricane forecaster William Gray says the 2000 season will not be as bad as first predicted. In his June forecast, the Colorado State University professor predicted 12 named storms, eight hurricanes and four major hurricanes. As CBS News Correspondent Byron Pitts reports, data received since the official start of the season June 1 has convinced Gray there will be only 11 named storms, seven hurricanes and three major hurricanes. Meanwhile, the first named storm of the Atlantic hurricane season slowed Saturday as it pulled away from the west coast of Africa. Tropical Storm Alberto is expected to strengthen as it moves over warmer waters. Alberto could become a hurricane in the next few days. Alberto grew from a tropical wave that came off the African coast earlier this week. It reached depression stage last night. It's still a week or more away from threatening any land areas. North Carolina emergency management officials said the new forecast won't make them relax, nearly a year after Hurricane Floyd flooded eastern North Carolina. "It only takes one here for it to be a bad year," Tom Ditt, a spokesman for the state Division of Emergency Management, said Friday. And 1992 is a perfect example that numbers don't matter. Hurricane Andrew hit South Florida in late August of 1992. A $25 billion disaster, Andrew was the first storm of the season. Emergency officials worry about hurricanes hitting during the summer tourist season because coastal populations are higher between Memorial Day and Labor Day. Full-time residents have experienced the storms, but "the tourist population turns over every Sunday," Ditt said. Last year, Hurricane Dennis hit in late August, Floyd came in September and Irene was in October, he said. "We're going into the meat of the season and if we can get beyond (Labor Day), we have less of a tourist population on the coast," Ditt said. Officials also worry that widespread, sustained rainfall since July will fill rivers and streams and create more flooding danger if a hurricane arrives before the water levels drop, Ditt said. Gray said cooler Atlantic Ocean surface water temperatures and a weakening La Nina are responsible for the declining threat. The season still will be busier than the average of 9.3 named storms, 5.8 hurricanes and 2.2 major hurricanes. The late onset of storms is not a factor in his decision to revise his forecast. "The fact that we haven't had an early season storm doesn't mean anything," Gray said. "There is no correlation between June and July storms and what may take place later in the season; in fact, there's some evidence for a slight negative correlation," he said, referring to fact that an absence of early season storms can be made up for by late-season activity. He said he expects the main season to occur more or less on schedule during the 60 days starting Aug. 20. "We thought we had verificatiothat La Nina would continue relatively strong throughout the season, but it appears to be fading a little more rapidly than we expected," Gray said. "Under those circumstances, we're reducing our early June forecast numbers a little, although people should remember that there still is the possibility of this being a very active season, especially compared with the 1970-1994 period," he added. Gray has warned that a decline in hurricanes from 1970-94 has lulled southeastern coastal dwellers into a false sense of security, particularly with the population boom in the region. What coastal dwellers should anticipate, Gray said, is an active hurricane season but slightly weaker than those that occurred in 1995, 1996, 1998 and 1999. The five years beginning in 1995 constitute the five most active consecutive years of hurricane activity in history, producing 65 named storms, 41 hurricanes and 20 major hurricanes. After Andrew, housing code standards were raised in South Florida. And despite the slow start to Hurricane Season 2000, companies that install hurricane shutters are back logged eight weeks. "We're just pulling our hair out trying to get them installed for everybody," said Nick Likakis, of Hurricane Shudders in Miami. One positive effect of Andrew was a heightened awareness among residents. "We're prepared. We have bottled water, canned food, a generator," said Cherl White, a Miami resident. So with the first storm of the season slowly churning this way, experts say now is the time to get ready. "Don't wait for a hurricane to come knocking at your door. Because if you're not prepared, it could cost you your life," warns Max Mayfield of the National Hurricane Center.